The Char-Broil tru Infrared portable grill2go gas grill is the full name of this nice portable propane gas grill that I use myself. After looking for a portable grill I decided to go for this Char Broil X200 and in this Char Broil Grill to go X200 review I will tell you all about my experience with this grill. TIP! Check the price here. I have paid $149. If you can get it under $115 GRAB IT! I have seen this grill on sale a lot!! Package is good an sturdy. Easy to unpack an hardly any assembly to do. Only thing I found about the Char Broil 200 after opening the box that there were no instructions on the few parts that had to be used. But it was pretty easy to see where they had to go. There are after all only a few Char Broil grill2go parts in the box. The assembly of the Char Broil X200 regulator could have been a little more clearer in the manual instructions. All you have to do is line up the red dot on the regulator with the indent in the gas-line and then turn it left or right and it will be secured. Removing it goes in reversed order. The Char Broil grill 2 go regulator works fine on mine but if you have any problems you can find a solution here. 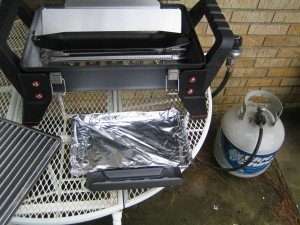 It comes with a nice and large grease catch pan compared to other grills I have used and like I always do I line it with aluminum foil or use the cheap aluminum pans you can buy at almost any grocery store. I have seasoned the grill like mentioned in the manual. This grill get HOT. With the lid closed, like you always do when you season a grill, the temperature gauge got way over of what it could read in no time, and it did heat up quickly. Later in my char broil x200 grill2go test I tried it, on the lowest setting of the regulator and, although it took longer of-course, the reading still got higher than the gauge its maximum. Like I mentioned in many of my reviews these kind of thermometers are not accurate so I take that with a grain of salt. I tested it with my Ivation thermometer, but more about that later. There were a few people who mentioned that the regulator does not work. That it just stays in high even when turned down. I have tested this and I had no problem with it. You can even hear the gas flow getting higher and lower when you turn the knob. If yours does not do that contact Char Broil for a replacement regulator. I read that this grill is not to good in windy situations and that the wind blows out the flame. I have tested this on my patio at the day I seasoned the grill and had it on purpose sitting in the wind to test this and had to reignite it twice. Turn the back of the grill to the wind and there is no problem. So here is a word of advice. Be careful in the wind and watch it or shelter it from the wind. If the flame goes out first turn the gas off and let is sit for few minutes with the lid open to air out the remaining gas before you re-ignite the grill. Safety first. This is one of the most heard complaints I guess. I personally think that a grill should be hot because that is the purpose of grilling. But I can understand that since this grill does only have one burner, and that means no cooler spots, it can be a problem. If this is a problem for you try to add a propane gas regulator or replace the hose you use to hook it up to a 20lb gas tank with a hose that includes a regulator and you can find my 3 recommendations here. This one of the hoses with regulator I found that has some great ratings. Available for high pressure like 30 psi or regular 20 psi. You can click on the picture to see the most recent price. I have to be honest and tell you that this is my first experience with the Char Broil infrared feature. To test I started with my infrared adventure with some burgers. I rather ruin a burger than a nice steak was my thoughts on this. I have to tell you that I was pleasantly surprised. I always thought that the “no flare ups” was a little bit of a sales pitch, but it is true. Absolutely no flare ups and that is almost impossible with a hamburger that has a fat content of 20%. On my other grills I always had to move it around to keep it away from the flare up and prevent is from burning. Problem I always had that I like to pat my burgers loose and if you have to move them they are not firm yet and sometimes fall apart. This is no problem with the X200 and I did not have to move them before I was flipping them over. 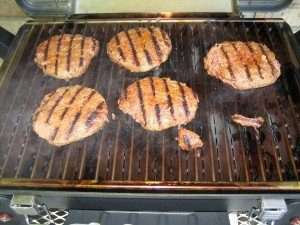 I had some great grill marks as you can see on the picture. This was the first time I used my handheld thermometer to check the internal temperature and this worked great. The infrared system cooks faster than a regular gas grill but in my opinion the result is also better. For a full explanation you can look at our what is an infrared grill article. Propane tank 16.4 Oz disposable. Can be used with 20 lbs tank. This is of-course not the largest grill you can buy, but for a portable gas grill the X200 has a nice size. The grill grate is 200 square inch and with the rule that you need 72 inch per person that is large enough for almost 3 people if you leave the recommended 20% space open. I have fitted 9 hamburgers on there myself with no problem and still room left to flip them over. I have been using the grill now for a few weeks and I am pretty happy with it. The only thing is that it gets hotter then hot. Most of the time I use it on the lowest setting of the gas regulator and this is hot enough for my kind of grilling. This grill will make some nice grill marks on your meat without having to leave it on there to long. I like to use my handheld thermometer and cook my meat just to the right temperature and than take it of and let it sit for a few minutes before I cut it. This works real good with this grill. The handles do not get hot at all. Like I think we should expect to be honest. The Char Broil company did a good job on this. Like I mentioned in the features the Cast aluminum firebox and lid make this grill heat up pretty fast and you don’t have to wait to long to start cooking. The other end is that it also cools of fast and that makes it even easier for me. No waiting for ever before you can put the cover back on. Within about 10 minutes you are ready to put to cover on. Bad thing is that you have to clean it right away with your grill brush. If you wait to long the grill is to cold to scrape it of with the brush. Although this grill gets hot you do not have to worry about where to place it on. There is hardly any heat coming from the bottom of the grill. The legs and handles do not get hot at all and I was surprised by that. I like to turn it on high for a few minutes while my meat is resting and than use a wire brush to clean the grill grates. After the grill cooled of I use the metal scraper that comes with the grill and scrap in between the grill grates. It says not to use the grill grate scraper on a hot grill. Got no idea why but I will contact Char Broil to find out the reason for this advice. My only concern would be the push button ignition feature. I wonder how long this will last. I had some other grills with this feature and they all went out after a while. I am just happy that it is a push button and not battery operated. The batteries always run out on the most unexpected moment and I think for an outdoor grill manual is the better option, but this is my personal opinion. Update: After more then 3 year the push-button ignition still works. I just cleaned it little. After a winter of not using my Char Broil x 200 the grill fired up at the first time. I read that someone had a built in propane tank in his RV and connected the grill to this with a quick connect hose with no problem. But make sure to have this checked by a RV dealer because the pressure needs to be correct or your gas grill will not work properly or can cause a dangerous situation. After using this grill for a while and getting used to the little adjustments to the Char Broil infrared grill system I have to say that I really like it. Easy to start and fairly easy to clean. Like I mentioned before the only negative thing is that the flame goes out in a windy situation. But once you know this you can prevent it by keeping it our of the wind. This small infrared grill get hotter than hot on its highest setting and just hot on the lowest setting of the gas regulator. The no flare ups is one of the things I like the most in combination with the nice grill marks you can make. Remember that this is a portable infrared grill and that the size of the grate is limited. The rectangle shape however makes it fully usable. I have not tested this yet with a digital probe thermometer but the temperature seems pretty consistent over the whole grill grate. Just on a little windy day I thought that the side where the wind came from was a little cooler. I have used a cheap little portable propane grill for a year to try if I would like to grill on gas and after that I decided to buy this one because of the great Char Broil infrared features I read in many reviews. The Char Broil X200 carry all measures 24L x 17W x 15 tall. Believe it or not, virtually exactly the same size as the unit itself. The case adds no additional size to the grill. Most of the time a grill carry case is a lot bigger and that makes them, in my opinion, useless. A portable grill is most of the time used on a camping trip and it always hard to find enough space already without having to deal with a big carrying case for your grill. 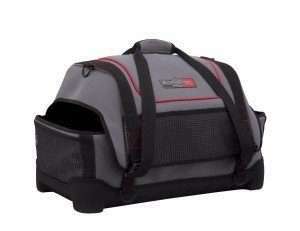 This carry all case can also be used as a grill cover for grill2go x200. I think that that if you read our Weber Q1000 review and compare it to the Char Broil X200 they both are very good grills. The X200 has a little more grill space with 200 square inches compared to the Q1000 with 189. The X200 has 9500 BTU and the Q1000 8500 BTU. The X200 has no stand available. The Q1000 does. The video from YouTube shows the unboxing of the grill. I hooked it up to a larger propane tank with the adapter hose that you can buy from Char Broil because I do not like to fool with the small gas tanks. No problem to use it this way. I have used this hose now for a long time and it works great. If you can get it under 15 dollar grab it. That’s a great deal! You can also have a look at our post about propane hoses, adapters, regulator and tank gauges to find a replacement. Can also be used for other types of table top grills to convert to a 20LB tank. 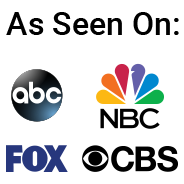 You can read all our Portable gas grill reviews by clicking here or look at the menu at the top of this page. I just gave away my big Weber gas because I hardly used it moving it in and out of my apt was a pain couldn’t leave it outside as I was afraid it would get ripped off. At any rate after reading & watching a ton of reviews bought this one on Amazon today. My first infrared should be interesting. I enjoyed your review, very helpful much appreciated. If you have any ideas where to buy ten lb propane tanks at a reasonable price please pass it along as they are about twice the price of 20 pounders. Thank you and I am glad the review helped. I have a 15lb propane tank that I buy at Lowes and I have not needed an other yet. I believe if you change it out it is about $18. I have used the X200 a lot and am still on my first tank. I am working on an update of the review because I read that a lot of people think this grill is to hot. I found an easy trick for that. Infrared has a little learning curve. I had to get used to it. Will let you know when the update is ready. Thx for this real life review. I was looking at a Weber baby-Q at first but they are way too expensive over here in Spain. But never liked the regulator sticking out. Something cleverly solved by Charbroil. What I would like to know is the actual cooking height. And working pressure for propane/butane. 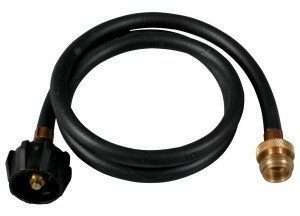 To select the correct extension hose with regulator. I plan to use a tray with grate for lower temp cooks. Creating some distance should make the difference in radiation heat transfer. Or even experiment with some alu taping of the burner in combination with the adjustable pressure. So I can have a hot and a cooler zone. As I think the total space is sufficient for me when I’m on the road. Thx again for helping me make my decision to go for the cheaper x200. And happy grilling. I still like my grill2gpo after using it now for 3 year with no problems. 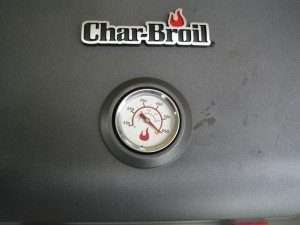 Since this is the Char Broil brand is should be good for the X200. I looked at their website and did not find any specifications for gas pressure. Would like to know if the things you are trying are helping. Feel free to contact me through info@bettergrils.com to keep me and the readers here updated. Have a great time in Spain I have been there several times myself. It is beautiful this time of the year and not too hot yet. Have been there several times myself. Just got ours. When I put the regulator into the slot (lining up the red dot with the notch and turning it), it is super lose. Is that normal? Yes, mine is also pretty loos but I never had a problem with it coming out. I think that if it does not come out this is how its meant to be. Thank you for your comment and let me know if I can help you with anything else. I still us my X200 a lot and still have no problems with it after having it for 3 years now. Replacing the regulator with one that has a better valve sounds like a great idea, but none of your examples appear to be able to connect to the grill. 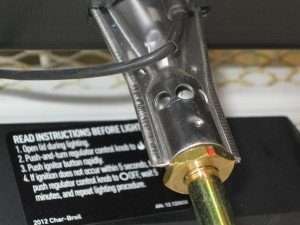 Are you connecting those regulator hose combinations to the Charbroil regulator? If so, how? Don’t know if you are talking about thee X200, but Charbroil has many models. What model are you talking about? I use this one I think: https://www.amazon.com/Char-Broil-5484667-Hose-and-Regulator/dp/B0194I48AG/ref=sr_1_fkmr3_1?ie=UTF8&qid=1524234294&sr=8-1-fkmr3&keywords=char+broil+hose+adapter+with+regulator, but it is a while ago. Let me know if this is the one you are looking for. If not I will try to find the one you need.